Food movement coalitions: Do you know of any? I’ve been giving talks lately on how to strengthen the food movement and my two-word answer is this: build coalitions. The food movement includes thousands of organizations working on food issues. For real power, those organizations need to unite around common goals. At a recent talk in Berkeley, I was asked if I could name some food movement coalitions. I had trouble thinking of any, but the audience popped up with suggestions and I’ve added a couple more. National Alliance for Nutrition and Activity (NANA): Its more than 500 organizations advocate for policies and programs to promote healthy eating and physical activity. 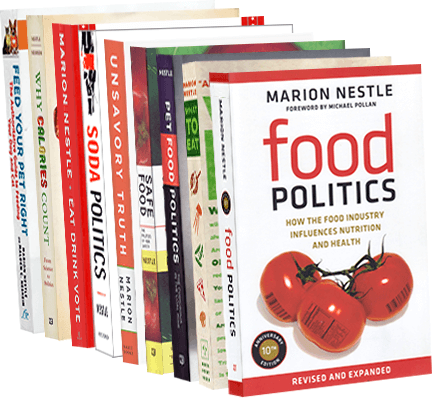 If you know of others, please let me know at marion.nestle@nyu.edu. I will be tracking these. As I posted last week, the New York Times has a handy guide to how to participate in politics. The American Public Health Association (APHA) also has a guide, Speak for Health, specifically focused on lobbying on behalf of health. Meet with your members of Congress or their staff, or invite them to visit you. Attend a public forum and ask a question. Submit an op-ed to your local paper. Email APHA for a template letter or technical assistance. Use Facebook or Twitter to engage your members of Congress. Make sure to use #SpeakForHealth! Email or call your members of Congress. Use an APHA action alert as a phone script or email message. It’s quick and easy. These ideas work for agriculture, food, and nutrition issues too. Use them. Andrew Fisher. Big Hunger: The Unholy Alliance between Corporate America and Anti-Hunger Groups. MIT Press, 2017. If you don’t understand why anti-hunger groups hardly ever advocate for higher wages or public health nutrition measures for low-income Americans, see Andy Fisher’s analysis: they owe too much to their food-company donors. Big Hunger is a call to action, one well worth heeding. Here’s his interview today in Civil Eats. Some new resources for food system advocates have just come my way. Use and enjoy! Food Tank and the James Beard Foundation have issued their third annual Good Food Guide, a searchable guide to 1,000 food nonprofit advocacy organizations. You can download the guide here. Healthy Food America offers a Sugar Overload Calculator. This is a mini-game that kids (or adults) can play to guess the sugars in commonly consumed foods. Most will surprise. Some will be a big surprise. Healthy Food America also has Maps of the Movement, illustrating where soda tax initiatives are underway in the United States. Can’t wait to see how they do on November 8. The World Cancer Research Fund International’s NOURISHING framework is a terrific introduction to policy approaches to promoting healthy diets and reducing obesity.